So, you have one or more properties up for sale here in the greater Los Angeles area. How do you effectively reach your prospective home buyers and ensure that they’re getting their eyes on your listings — or seeing the property for themselves in person, for that matter? Like selling just about anything, it really does come down to marketing and advertising. Simply sticking a “for sale sign” in the front yard with your name and number just isn’t going to cut it, especially when you consider today’s digital marketing standards. Truly, these days, most people are online, and that’s exactly where you should be connecting with them. Perfect for sharing on a variety of social media channels and platforms, people love watching videos. They’re easy to view, provide a great visual aspect, and can even serve as a complete “virtual tour” of a given property. Naturally, there are many ways to get your listings out there to help connect the right homebuyers to the right properties. However, Jonathan The Drone Guy is inclined to emphasize the importance of his Los Angeles real estate drone services. With a greater ROI for your marketing budget, increased client engagement, and faster turnaround times for your properties, you can’t miss out on this deal. Learn more here! 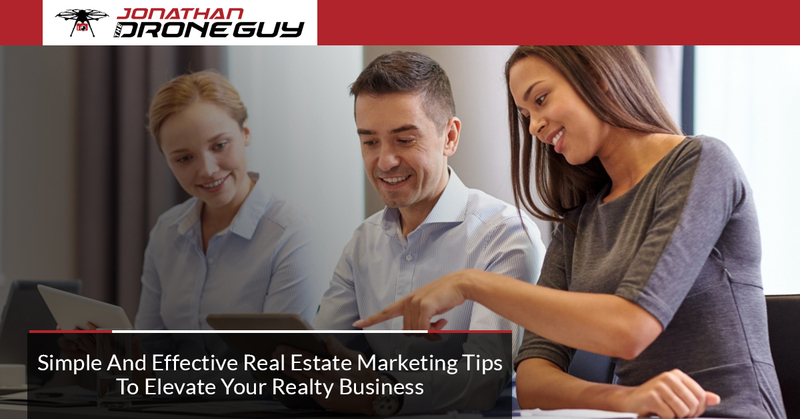 Below, you’ll find several simple yet effective tips to help realtors like you market their properties. A “Contact Us” or “Contact Me” button is going to be your best friend as a realtor, and should be extremely easy for interested buyers to locate. When people search something on Google, they want answers — fast. Google My Business is great because when someone types in a business on Google, information about said business is cleanly and neatly presented at the very top of the page. The more thorough your GMB information is, the better. If your clientele and target demographic are more “advanced” in years, consider old school, tried-and-true marketing with mailers and flyers. For those who don’t go online very much — or not at all — they’re still bound to check their mail. Print advertising still works, but success with print advertising depends on who you’re trying to reach. Think of Zillow as something akin to the Yelp of real estate marketing. If you’re not on Zillow, then you’re not doing your digital marketing right. Offering the ability to advertise on their site as an agent, this will significantly help boost your listings. Professionally-shot video and photography is a powerful asset to realtors. With the help of Jonathan The Drone Guy, his real estate drone photography and real estate video services will help turn would-be home buyers into satisfied new homeowners. Don’t wait — get started by contacting Jonathan today!